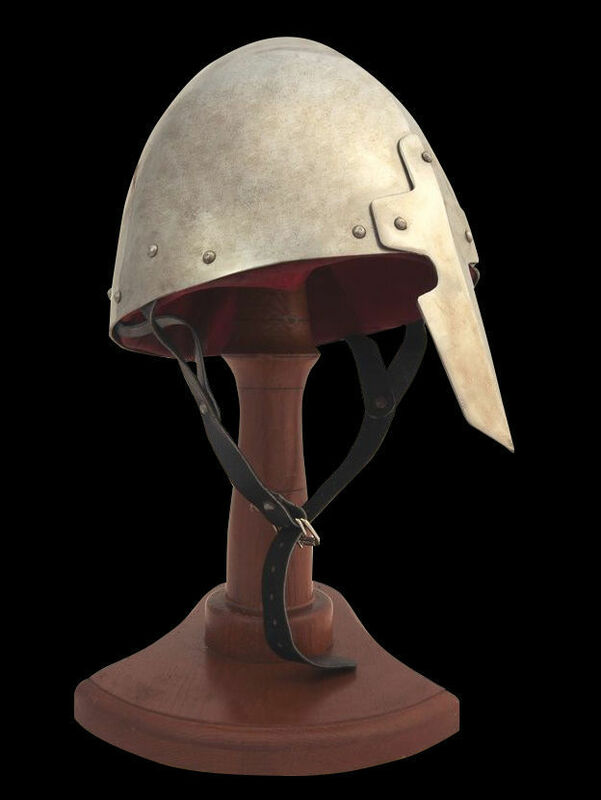 This type of open conical helmet was very popular in Medieval Europe and the East during X-XIV centuries. It is called "Norman helm" or "Nasal helmet" (helmet with nasel) as Western historians call it. Helmet was used either with or without mail aventail for face and neck protection. Typical feature of this early combat helm is a nasal plate, which covers the nose and protects central part of the face. 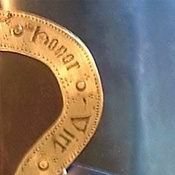 Nose guard is riveted to the dome with steel or brass rivets. We recommend wearing nasal helm over mail coif for better face and neck protection, as your medieval comrade in arms did. You may also like these models of open helmets: helmet from Tagancha (Ukraine) of the XIII century; helm of Nikolskoe, XII-XIII centuries. Hat-shaped helmet Chapel (Kettle helm) was widespread among the infantrymen in the XIII-XVI centuries. Such popularity was a result of cheapness and ease of manufacture. However, cream of knighthood preferred not to use such type of head protection because of its plain design. This model with bar grill visor is perfect for medieval fencing, because this helmet has the main characteristics: it provides with good field of vision, ventilation and reliable protection. According to SCA-standards, distance between the rods is 1.8-2 cm. Also, we may install back plate for neck protection. Underchin leather belt with buckle fixes helmet on your head. You can use this functional handcrafted custom helmet for: SCA HEMA Larp Stage performances Medieval festivals Reenactment events Main photo shows medieval helmet with following options: Cold-rolled steel 1.5 mm; Satin polishing as finish treatment; Black leather belt; Steel rivets; Steel nickel-plated buckles; Sewn liner Base price i..
Conical SCA helmet with the grid and full protection of the neck is perfect model of battle helm for medieval fencing, bohurts and combats. This head armor is not a replica, but stylization of the Middle Ages helm. This functional helmet is completed with back plate for neck protection, cheek guards and steel bar grid. Such design provides with not only perfect defense during the fight, but also with good field of view and breathing. You can use this medieval steel armor for: SCA HEMA Larp Stage performances Medieval festivals Reenactment events Main photo shows helmet with lifting visor with following options: Cold-rolled steel 1.5 mm; Mirror polishing as finish treatment; Steel rivets; Sewn liner Base price includes following options: Cold-rolled steel 1.5 mm; Satin polishing; Brown leather belts; Steel nickel-plated buckles; Steel rivets; Sewn liner; No vervelles for aventail In options, you may choose another type and thickness of metal, color of belts, fini..
Bascinet is version of steel liners (under helmet). 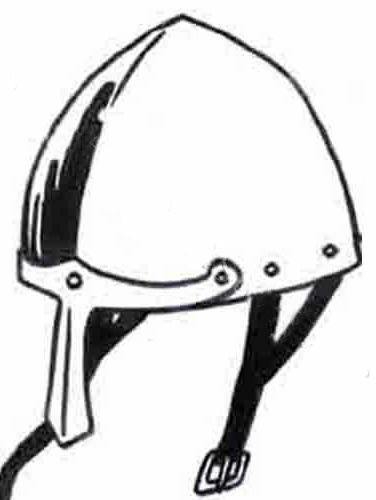 Approximately from the epoch of the Crusades, Western European chivalry mainly used topfhelm (Great Helm or pot helm) as the primary helmet together with steel caps (skullcaps, also known as cervelliere) worn under it. Bascinet evolved from such skullcap into complete head protection with dome and visor of various design. This visorless model is one of the very early bascinets. 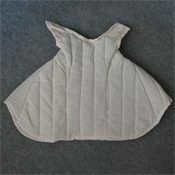 Face could be protected with padded camail and mail coif or aventail for protection of neck, shoulders and upper part of chest. You may order it separately in our store or choose it in options available for this item. 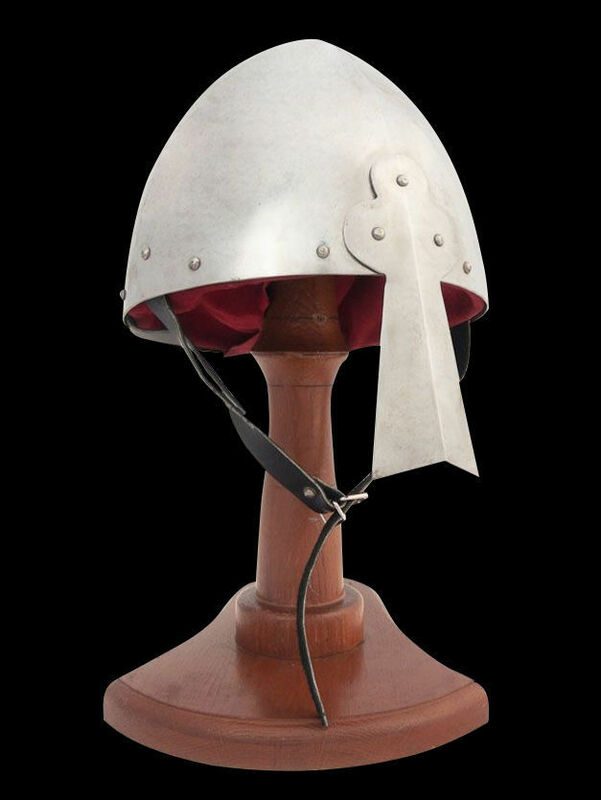 This made-to-measure Middle Ages helmet is completely handcrafted by our artisans. You can use this medieval knight helmet for: SCA HEMA Larp Stage performances Medieval festivals Reenactment events Main photo shows authentic medieval steel helmet with following options: Cold-rolled steel 1.5 mm; Satin polishing as finish treatment; Red leather for av..